Introducing the Aspire Revvo Mini Tank. The latest addition to the awesome Revvo tank line, introducing the new Revvo Mini. 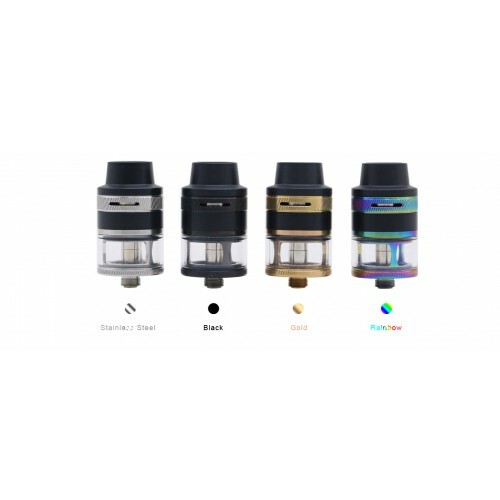 The Revvo Mini is a more compact version of the original Revvo tank, lower profile and slimmer than the original Revvo tank. Of course, it still employs the legendary ARC radial coil for awesome flavor and vapor production, but now in an even more compact package to fit slimmer mods. It comes in four stylish and fashionable colors too, Stainless Steel, Black Gold and Rainbow. Filling the Revvo mini tank is another of Aspire's innovative designs, and it couldn't be simpler. In the centre of the tank, accessible directly through the mouthpiece, sits a spring-loaded filling tube. The spring of the tube is soft enough to allow even slight pressure from almost any type of bottle/glass dropper to open it, but strong enough to create a leak proof seal when released after filling and the strong Pyrex glass tank allows you to see at a glance the amount of e-liquid in the tank. Fitting or replacing the new Aspire 'radial' coil has also been made almost too easy for words. Simply unscrew the mouthpiece/top-cap, unscrew the coil mounting screw, remove the used coil, drop another coil over the filling tube, ensure that it is sitting flush with the body of the tank around all sides, screw on the coil mounting screw and the mouthpiece/top-cap and that's it! It can even be changed with e-liquid still in the tank. As an added function, the conical coil mounting screw also acts as a spit-back protector, just in case. To get the maximum benefit from the impressive revolutionary ARC coil, Aspire designed an equally impressive airflow system. The Revvo Mini has a fully adjustable top airflow by way of 3 airflow slots. The air is drawn down, over, and around the radial coil maximizing the vapor and flavor delivered through the mouthpiece for the most satisfying vape experience.